Thierry Henry is a name synonymous with victory, legendary status and a deadly striker whose sole desire is to beat his opponent. Henry is not only famous among Arsenal faithfuls but everyone who ever watched the French forward during his prime years in England. The retired French footballer is a record goalscorer for English side Arsenal as well as French national team. This short biography profiles the legend's childhood life, his football career and achievements. Thierry Daniel Henry was born in 17 August, 1977 in Les Ulis, a small suburban town in Paris to Antoine and Marylese Henry. He spent his childhood life in a ghetto-like neighborhood. Although the family lived in a small apartment, his father encouraged him to play sports and invest most of his energy into athletics. Antoine used to take Henry to local soccer matches and soon it became evident that he was a better soccer player compared to children of his age. He joined the junior team of Les Ulis and Palaiseau and at the age of 13 he was already playing for the Under-15 team for Viry-Chatillon. When is parents separated, his mother took him to Orsay to join Alexander Fleming School where he focused more on soccer. At the age of 14, he was chosen into the French Football Federation's Clairefontaine Academy. While at the Academy, Henry signed an apprentice contract with then Monaco manager, Arsene Wenger and made his first professional appearance in 1994 where his side lost 2-0 to Nice. In 1996, Henry became France's Young Player of the year under the tutelage of Wenger. He led France's Under-18 team during the European Championship, scoring 7 goals in the competition. His splendid performances earned him a place in the French team that represented France and won the FIFA World Cup in 1998. Here he played alongside great players such as Patrick Vieira (Arsenal), Laurent Blanc (Olympique Marseille), Marcel Desailly (AC Milan), Zinedine Zidane (Juventus), Robert Pires (FC Metz), Lilian Thuram (Parma), Fabian Barthez (AS Monaco) and Emmanuel Petit (Arsenal). 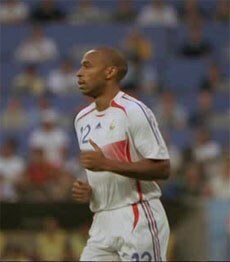 Henry scored 20 goals in 105 matches for Monaco before joining Juventus in 1999, paying 10.5 million pounds to get the French footballer into the Italian Serie A. Henry would not make the expected success in Juve and after only one season he joined Arsenal for 11 million pounds where he was united with his mentor Arsene Wenger. Although his primary role was a left-winger, Wenger converted Henry into a striker where he later blossomed into one of the most lethal strikers English Premier League has ever seen. He became the team's main goalscorer and after a great first season his second season at Arsenal was even more successful. He led Arsenal to FA Cup final against Liverpool but came short of victory after succumbing to a 2-1 defeat at Wembley. In the 2001/2002 season, Thierry Henry scored 24 goals in the league, emerging as the league's top goal scorer. He also led Arsenal to a double where they won Barclays Premier League and the FA Cup. The following year he scored another 32 goals for Arsenal in all competitions togheter, leading his club to another FA Cup trophy where he was named the man of the match in the finals. In 2003/2004, Henry was the Premier League's top scorer with a fantastic 30 goals, helping Arsenal win the title without losing even a single match. This earned them the title The Invincibles, a feat last achieved by Preston North End (1888/1889) 115 years before Arsenal did it again in 2003/2004. In 2004, Henry became first player in half a century to be named FWA Footballer of the Year for two consecutive years. In 2005, he guided Arsenal to FA Cup final against Manchester United but suffered a knee injury that kept him out of the final match where Arsenal won their 10th FA Cup. On 17th October, 2006, Henry broke Ian Wright's record of 185 goals to become Arsenal's all time top scorer, and is the current Arsenal's all time top scorer with 228 goals. He was voted the Footballer of the Year in EPL for the 3rd time, making him the first to receive the coveted award 3 times in 59 years. To be sure no one forgets the Arsenal hero a bronze statue have been placed outside the Emirates Stadium, which is one of a five statues that immortalizes Arsenal stars outside the stadium. Besides the World Cup victory in 2002, Thierry Henry was also a part of the team that followed up by winning the UEFA Euro in 2000. Two years later the mood was lower after a complete fiasco for the French team in Korea/Japan World Cup and a frustrated Henry got a red card against Uruguay in the second game. Things would go better in 2006 World Cup in which France reach the final (Italy would win after a penalty shootout) with Henry in the team. He captained his side in the UEFA Champions League final against Spanish giants FC Barcelona in 2006, but lost the match 2-1 after German goalkeeper Jens Lehman was shown a red card reducing Arsenal to 10 men. One year later, Henry joined Barcelona for 24 million pounds where he scored his first goal for the Spanish side in their 3-0 humbling of Olympique Lyon in Champions League. Henry was part of a Barcelona side that won six trophies under then manager Pep Guardiola in 2009, consisting of Copa del Rey, Spanish La Liga, Spanish Supercup, EUFA Champions League, UEFA Supercup and FIFA Club World Cup. In 2010, he moved to the US where he signed a contract with MLS side New York Red Bulls and scored his first goal for the club in their 2-0 win over San Jose Earthquakes. He went back to Arsenal for a 2 month loan spell during the 2011-2012 season and scored key goals, including the only goal against Leeds United in the FA Cup 3rd round. In 2012, he returned to Red Bulls where he scored his first hat-trick for the MLS club in their 5-2 win against Montreal Impact. He left New York Red Bulls on 1st December 2014 and announced his retirement on 16th December 2014. After the shoes was put on the shelf, Henry would work for Sky Sports as an expert commentary. Henry married Claire Merry in 2003 and had a child with her named Tea. But they officially divorced five years later in December 2008.